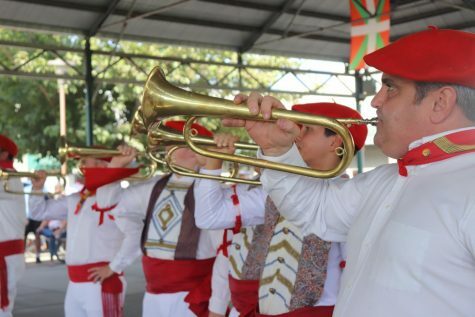 Basques living in the United States today are well aware that Basque missionaries have been sent over the years by the Diocese of Bayonne, France to minister to their various spiritual needs. 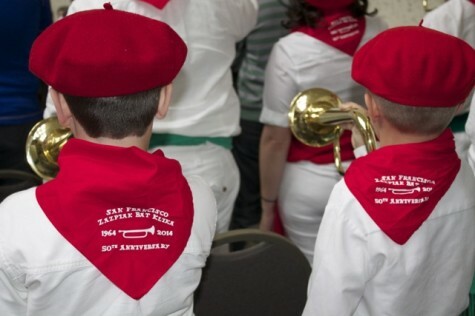 The role of these priests since 1961 has been instrumental in the continuation of the Basque culture here in America. The Bishop of Bayonne began sending missionaries here following the death of Fr. 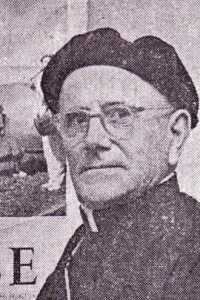 Charles Espelette in 1958, a Benedictine monk who ministered to the American Basques from an old monastery in Montebello, California. But not many people today are aware that Fr. Espelette was a Benedictine monk sent to Montebello from Sacred Heart Abbey in the middle of Oklahoma Indian country and that he was one of the last members of a monastic community of about 50 Basque monks, brothers, clerics and nuns who were associated with Sacred Heart Abbey from 1881 to 1966. 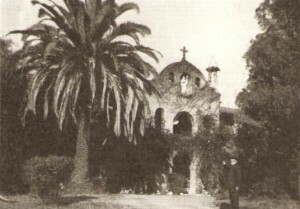 The Oklahoma community established the monastery in Southern California in 1905 specifically to minister to the needs of the Basque population living in the western states. This is the story of how this community of Basque Benedictines arrived in Oklahoma, how they expanded their activities to California and the various contributions they made both to the religious and educational communities they served as well as to the Basque families residing in America. 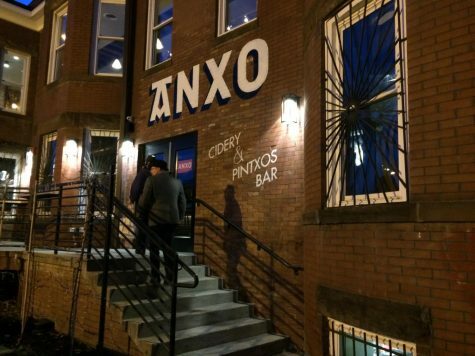 This story is intended to resurrect the history of these forgotten servants and to revive the memory of their involvement in the Basque culture of America. There have been references to these Benedictines by Basque historians but they have been sketchy and misinterpreted. In 1894, a Basque newspaper, California’ko Eskual Herria, published in Los Angeles, wrote a series of articles regarding “a group of Basque priests who had founded a mission in Oklahoma Territory” (Douglass 1975). The following year the same newspaper published an article by a French priest that “chastised the California colony for not having taken steps to secure a Basque chaplain” (Douglass 1975). 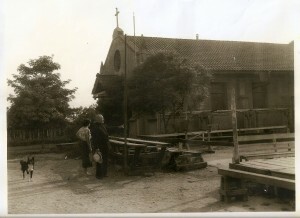 In 1910, Pierre Llande, in L’Emigration Basque noted that Bishop Conaty of Los Angeles requested missionaries be sent by the Bishop of Bayonne and later were successful in building a monastery in Montebello (Llande 1910). Llande does not mention the role of Sacred Heart Abbey in his book. The only reference in Adrian Gachiteguy’s Les Basques dans L’Ouest Americain, regarding these missionaries was that “Fr. Gariador, resident of Los Angeles” was summoned to assist the Basques of Buffalo, Wyoming in celebrating the Feast of the Assumption in 1918 (Gachiteguy 1955). 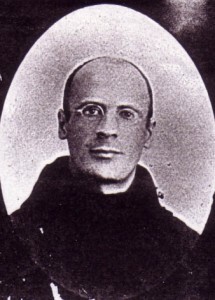 In 1918, Fr. Gariador was a resident of Oklahoma and there is no mention of Sacred Heart. 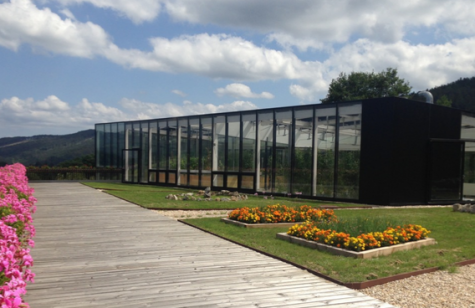 Douglass and Bilbao in Amerikanuak do mention the group but only devote a couple of paragraphs to them either because their story did not merit more or they were unaware of the significant involvement of this group in the greater Basque community. 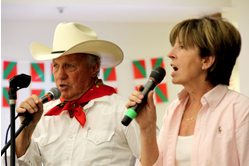 Most recently in 1998, Nancy Zubiri in A Travel Guide to Basque America mentions that both Fr. Espelette and Fr. 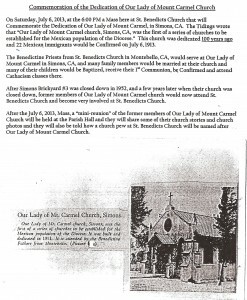 Gariador served at the Mt Carmel Church in Montebello but she does not mention the wider Basque Benedictine community. Almost concurrently with the publication of Amerikanuak, Father Joseph F Murphy published in 1974, Tenacious Monks – The Oklahoma Benedictines, 1875-1975: Indian Missionaries, Catholic Founders, Educators and Agriculturists. This detailed 100-year history of Sacred Heart Abbey tells the story of this monastic community including the Basque contingent. 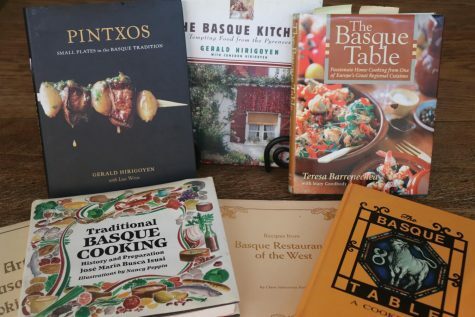 Although Amerikanuak remains the principal work on Basque history in America, it appears that Douglass and Bilbao as well as the other authors have been unaware of the details of this truly remarkable story of the Basque Benedictine community at Sacred Heart. The first Basque to spend significant time in Oklahoma was Fr. Thomas Duperou, a native of Ciboure, France. He initially trained and professed his vows at St. Pierre-qui-Vire. From there he teamed up with another Basque in 1875, Fr. Augustine Bastres to establish a new dependency in Urt, France called Our Lady of Belloc. Fr. 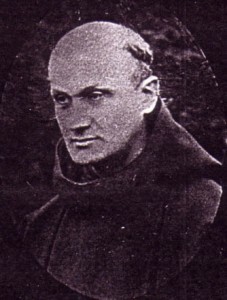 Bastres remained in Belloc as its first Abbot while Fr. Duperou traveled around the various European monasteries in search of a place for the young Basque exiles. Eventually, he found an ancient monastic site in Buckfast, England and established it as a new monastery in 1882, acting as superior of that monastery until 1884. He made such an impression on his superiors that the Abbot General of the Congregation then requested that Duperou go to Oklahoma to take charge as it was extremely difficult to implement the monastic rituals in this territory. 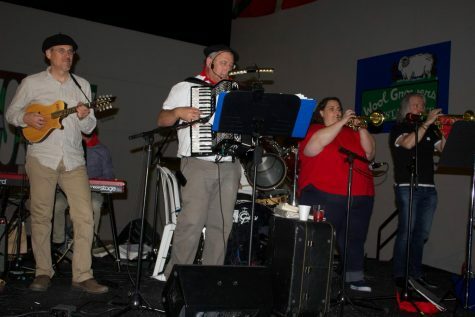 It is apparent that this move to Oklahoma also provided the link to many more Basques moving there. He is given great credit in guiding Sacred Heart during its early years. He was elected the first actual Abbot of the monastery in 1896 a year before his death. During the 1890’s a number of exploratory expeditions were taken from Oklahoma by the Basque missionaries to visit the various settlements of Basques in the American West. 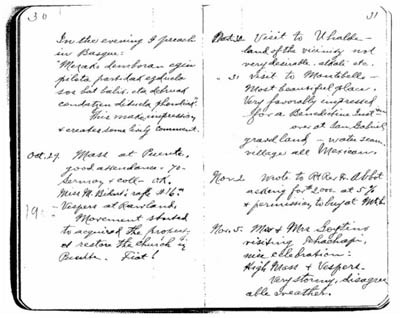 Records indicate that Frs Leo Gariador, Gratian Ardans and Hippolyte Topet undertook these missionary trips. In 1905, Frs Gariador and Ardans, who were first cousins from Aldude, France arrived in Southern California with the intent of establishing a permanent Benedictine monastery there. Initially, they took up residence in the Tehachapi area but later discovered that Montebello would prove to be a better site. They were invited by Bishop Thomas Conaty in his letter written to Fr. Gariador on March 22, 1906 to “establish the Order at Montebello, California, with the express condition that it will be their duty – first, to look after the spiritual needs of the Basques throughout the diocese…secondly, to have quasi-parochial rights over Montebello, Newmark, Rowland and Puente…” (Murphy 1974) Fr. Gariador immediately purchased 40 acres in Montebello on behalf of the community and they began constructing the original chapel and living quarters. Since the Bishop had given the monks responsibility for both missionary works among the Basques as well as local parish activities, Fr Ardans remained in Southern California to look after the local parishes while Fr. Gariador assumed the role of itinerant missionary. According to the diaries of Fr Gariador during the period of 1905-1909, he traveled extensively among the Basques of Southern California as well as traveling to Northern California, Nevada, Utah, Idaho, Montana, Oregon and Wyoming. 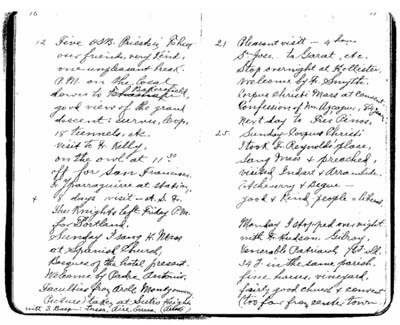 Various entries to his diaries make mention of the families he visited as well as the numbers of Basques who attended mass and/or confession. He gives credit to those who had been generous such as the Bastanchurys of Fullerton and the Goytinos of Lancaster among many others. In 1909, Fr Gariador was named Prior-Administrator of Sacred Heart Abbey and was summoned back to Oklahoma to assume his new duties. In Southern California the activities of the monks expanded to three parishes. In Montebello, the Simon brothers, who owned the local brickyard became large benefactors and assisted in building a parish church called Our Lady of Mt. Carmel. They also donated the land in order to build the monastery building and grounds for fruit trees and gardens. These buildings acted as the monastery headquarters in California until 1958. The area was heavily populated with Mexican workers who became the primary parishioners of this new church. In La Puente, an old Methodist Church was converted to a Catholic parish in 1905 and given the name of St. Joseph’s Catholic Church. Initially, a Basque priest from Montebello would arrive there to say mass on weekends but later Fr. Hippolyte Topet took up residency at the church. In 1920 the parish was transferred to the Los Angeles diocesan clergy. In 1910, Fr. Ardans established the Our Lady of Lourdes parish in the Belvedere area of East Los Angeles. For years, that parish and the school that he established were the largest in the diocese. Fr. Ardans remained its parish pastor until 1930. 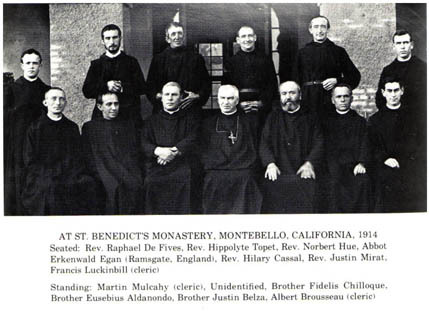 In addition to the original three priests who came to California, the following Benedictines were also present from 1905 to 1920: Frs Aloysius Hitta, Ildephonse Elissalde, Vincent Montibalet, Clement Dupont. Brothers included Edouard Laco, Eusebius Aldanondo, Fidele Chilloque, Sebastian Eisburu along with a number of clerics. Vincent Monibalet was in charge of the California community from 1915-1920. Although the Benedictines were able to attract a number of monks and brothers, it was never large enough to be more than an extension of Sacred Heart Abbey in Oklahoma. Slowly, the community declined as the monks and brothers aged and died with some returning to France. By the late 1920s, only Frs. Topet and Ardans remained in the Los Angeles area. Fr. Topet lived there until his death in 1938 and after a period of time in Oklahoma, Fr Ardans returned to Southern California in 1938 to live until he died in 1953. Fr Espelette, a native of Aldude, France, was the last of the Basques to arrive in Oklahoma in 1903. He was ordained in 1910 and while visiting the Basque country in 1914 he was summoned as a soldier in the French army. He served as a medic and returned to Oklahoma in 1919 “with war cross, three citations, papers, still carries fragment of bullet in arm” (Gariador 1919). He was one of the most active and respected monks having been a professor in Oklahoma for a number of years and coming permanently to Southern California in 1933 after which he took up the role of the itinerant Basque missionary from Fr. Topet. He took up residence in the old monastery in 1940 until his death in 1958. Fr. Espelette, also founded the Southern California Eskualdun Club in 1946 from the monastery in Montebello and he taught and organized the young Basques in dancing their traditional dances for many years. The decline of the community of Basques in Montebello would actually provide a windfall for its parent monastery of Sacred Heart Abbey and more importantly its successor, St Gregory’s Abbey. As oil became a major industry in Southern California the property owned by the monks in Montebello held substantial oil reserves. Over the years, various oil companies pumped for oil and provided much needed funds for the Abbey activities in Oklahoma. Additionally, as development occurred, pieces of the property were sold off including the last parcel after Fr. Espelette died. The large sums of money gained from these California properties enhanced greatly the eventual construction of St. Gregory’s Abbey and University which is discussed later. As previously mentioned Fr. Gariador was summoned back to Oklahoma to take over the administrative duties of Sacred Heart Abbey as Prior-Administrator in 1909. This was a difficult move for him, as he preferred to remain in California but the Abbey as a whole was undergoing significant issues. Lack of manpower was a constant concern as the local parishes sought the scarce priests as well. There was pressure from the Congregation of Primitive Observance to maintain a dedicated Benedictine routine but again manpower prevented the self-sufficiency of the Oklahoma monastery not to mention the one in Montebello. Additionally, for years there was an underlying division in the community between the American-born clergy and those from Europe dominated by the Basque contingent. 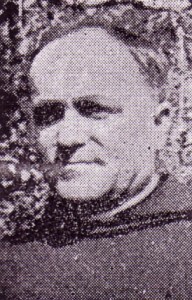 The tensions broke loose when instead of an Abbatial election in 1909, Fr Leo Gariador was appointed Prior-Administrator after the Official Visit of his older brother, Fr. Benoit Gariador. The actual appointment was by the Abbot General in Rome but the fact that Fr. Benoit had just returned to Rome with his recommendation incensed the American monks as an act of nepotism. All the above issues would mire the administration of Fr. Gariador until a new leader was named in 1922. It is important to note specifically the diaries of Father Leo Gariador. The archives of St. Gregory’s Abbey contain many volumes of small black books in which he would make entries from just days prior to his ordination in 1887 until his last entry in June 1938. He initially writes in French but by 1890 he has learned and switched to English. Occasionally he prays in Latin and uses Basque when referring to family and countrymen. 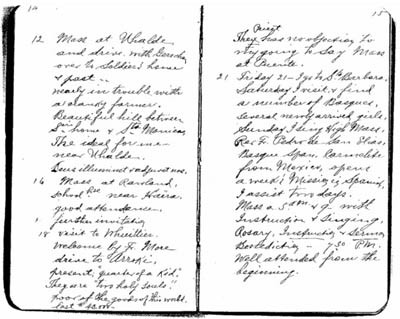 His entries included reports on business transactions, visitations, weather, crops and special prayers such as after the San Francisco earthquake of 1906. In April 1912, he notes that his “brother sailed from New York on La Provence saw and avoided icebergs…(however) the Titanic struck iceberg, exploded and sunk” ironically after the two ships crossed paths in the Atlantic (Gariador 1912). His diaries were a significant source for Fr. Murphy in writing Tenacious Monks as it covers so many aspects of life for the monks. Fr. 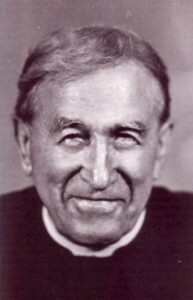 Leo would remain at Sacred Heart even after most of the principal activities were transferred to St Gregory’s Abbey and would die there in 1940. His brother, Fr. 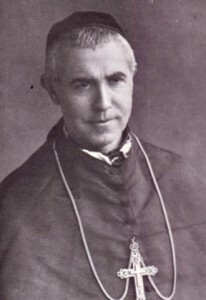 Benoit was Prior of Buckfast Abbey from 1885 – 1899, then established a monastery in Jerusalem in the Holy Land and was elected as Abbot General of the entire Congregation of Primitive Observance in 1920. He had a variety of writings on Catholic Theological history published. He died in 1936 and is buried in Jerusalem. During Fr. Leo’s administration though, the Abbey embarked on its most long lasting legacies. Sacred Heart Abbey was always dedicated to education having established a school from the outset; however, the community always aspired to create a university. In 1910, Fr Gariador concluded a long series of negotiations to establish the Catholic University of Oklahoma in Shawnee. His diaries during those years document his activities and his prayers to succeed in building the Catholic University. By 1922, the name was changed to St. Gregory’s College and it’s still in existence today as St. Gregory’s University. In addition to the University, they also established a monastery there by the name of St. Gregory’s Abbey. 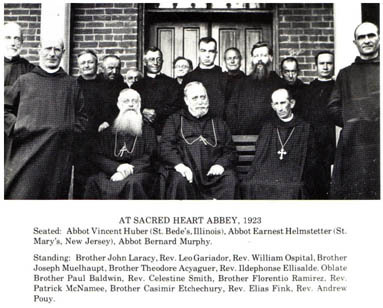 Most of the activities of Sacred Heart Abbey were transferred there in 1929 and at the same time the community also separated from its European roots by joining with the American Cassinese Congregation. Fr. Blaise Haritchabalet was President of the University until 1924. He taught Latin, philosophy and Holy Scripture and he held the position of Master of Novices until his death in 1949. Br. Theodore Ayzaguer, who also remained in Oklahoma, was noted to have become a skilled artisan and hand carved a number of beautiful altars. It was not just the monks and brothers who were affected by the anti-clerical measures in France, but many nun were exiles as well. As mentioned above Fr. Duperou brought back four nuns in 1889 who undertook the work of cooking and sewing as well as teaching in the school. In 1890 four more came from the Basque country, Srs. Pholmene Gorostiz, Veronique Etcheverry, Dorothee Ramirez and Florentine Ramirez. In 1895, three nuns arrived from Bearn region of France and in 1903 the final caravan arrived including Gertrude Berho, Marthe Arhancet, Marie Necibar, Julie Arcondeguy and Marguerite Ithusarry. Some of the nuns had siblings among them in the community. Sr. Philomena Gorostiz who arrived in 1890 continued to make the habits of the monks until near her death in 1952. Eventually some of the nuns were transferred to a convent in Louisiana but many remained at Sacred Heart for the remainder of their lives. Like the monastery in Montebello, the Basque contingent at Sacred Heart Abbey also declined over the years as the monks and brothers aged. Of the three monasteries run by the Oklahoma Benedictines, only St. Gregory’s Abbey survives today. A handful of monks and brothers continued the monastic life at Sacred Heart Abbey and are buried in the little cemetery on the property. Among those are Frs. Leo Gariador, Clement Dupont, Placide Harismendy, Blaise Haritchabalet, Guillaume Ospital; Brs Henri Aldanondo, Theodore Ayzaguer and Casimir Etchechury. The last Basque monk to die and be buried at Sacred Heart was Eloi Justou in 1966 and the last of the nuns, Benedicta Lansamin died in 1965. The buildings were razed in the 1950’s however the site is listed on the National List of Historic Places where people can still visit the grounds and the cemetery. Except where cited otherwise, this story of the Basque Benedictines of Sacred Heart is a summary of the Basque activities found in the book, Tenacious Monks by Father Murphy. This 465-page history of the Sacred Heart Mission provides great detail of the activities of the entire monastic community including the Basques. There is so much more information regarding the Basques in this book as well as in the diaries of Fr. Leo Gariador from which Fr. Murphy quoted extensively. Other references to correspondence and documents by Fr. Murphy indicate that there are additional research materials in other Abbeys and parochial archives that might provide further insight to the activities of the Basque Benedictines as well as the general Basque community. 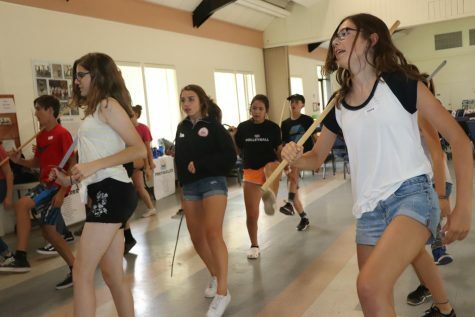 The activities of this community were intertwined with maintaining the Basque culture and spiritual needs of the various Basque families living here much like the Basque missionaries sent by the Bishop of Bayonne today. Although, forced into exile in America because of the anti-clerical laws of the French government, they endured the hardships of living in the Oklahoma Territory among the Indian populations that were trying to mainstream into American culture. They answered the call to send Basque clergy among the many Basque immigrants in the American West. They displayed the typical Basque character of surviving as a distinct cultural group within a larger non-Basque environment. The Basque Benedictines of Sacred Heart Abbey is a story that is completely unknown by the current generation of Basque families. Hopefully, this brief summary of their activities allows their memory to be shared again and to appreciate the tremendous efforts of this holy community. A special word of thanks and gratitude to St. Gregory’s Abbey for retaining the records of these Benedictines and especially to Fr. Patrick McCool and Br. Benet Exton for providing the author with a copy of Tenacious Monks, copies of the diaries of Fr. Leo Gariador and many more documents relating to these wonderful Benedictines. 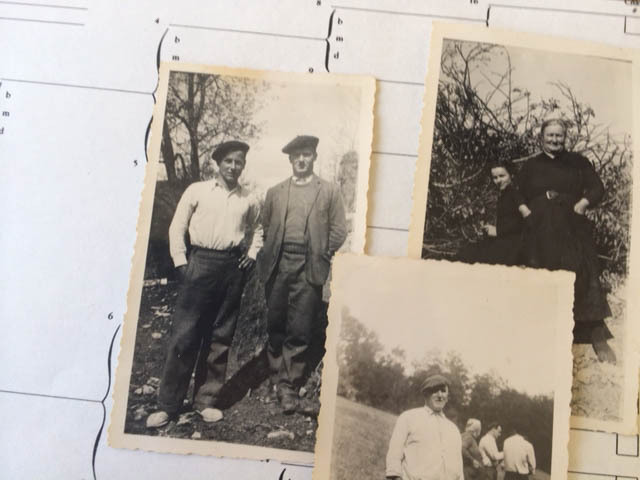 Also, a special thank you to my father, Jean Baptiste Gariador, who planted the seeds of this story in my mind while I was a young boy listening to his stories of his family and the Basque Country. Those stories included the accomplishments of his two great uncles, Frs. Benoit and Leo, which led me on a lifelong search for written information regarding their activities and ultimately to write this story. Murphy, Joseph F. (1974) Tenacious Monks – The Oklahoma Benedictines, 1875-1975: Indian Missionaries, Catholic Founders, Educators and Agriculturists, Shawnee Oklahoma: Benedictine Color Press, St. Gregory’s Abbey. The following photos and documents were contributed by Ray Ramirez, at the time of the 100th year commemoration of Our Lady of Mt. Carmel Church, which was celebrated at St. Benedict Church in Montebello, Calif. on July 6, 2013. Fr. Charles Espelette at Our Lady of Mt. Carmel Church, Montebello, Calif.
100 years of Our Lady of Mt. Carmel Church commemorated at St. Benedict Church in Montebello. Calif.